Know that Recess very intentionally runs on a "tentative," "rolling," "inspired," schedule at all times, so that we are able to make the best decision for the moment in that moment. But if you are off site and curious, this is the "idea." Thursday Event Arrival Information: Dinner and opening circle at 6pm, feel free to arrive anytime earlier, but know that we'll joyfully ask (and expect) you to help us set up! Music starts at 9pm. Daily Workshop Times: 2pm -4:30pm. Finally, after years of anticipation, Recess is producing its first event on the East Coast!! The setting is 84 acres of hardwood forest in their peak fall color 20 minutes outside of Chapel Hill, North Carolina. There will be dancing and skill-share workshops during the day and dances raging into the dawn. We will have ecstatic dance sessions, contact jams, and countless hours of some of the most inspiring live and DJed Blues, Alt-Blues, and Fusion music you'll hear anywhere. You will be fed all local, organic food as we all work together to co-produce an experience beyond the every day. Stay tuned as we confirm details with live acts, instructors, scheduling, and DJs. Please pay at the upper end of what you can afford to help make this event affordable and accessible for everyone in the community. If you pay through our credit card checkout the set prices will be slightly higher to account for our credit card fees. The hired instructor lineup is still to be announced, but we will have multiple class periods a day with a large assortment of classes and instructors to choose from. There will be classes held on partner dancing, solo dance, non-dance movement arts, social and community building topics, and more! There will also be opportunities for anyone to teach workshops through a Skill-Share. Meaning, if you have something (anything!) you want to teach, you bring the class and we'll create the space where you get to teach it to your community. Because to be real, aren't we all both students and teachers? Sign up to be a Volunteer, just cuz its what makes it all worth it. Recess is teaming up with the Research Triangle's premier blues dance event: Tobacco Road Blues. Tobacco Road will be held the weekend before the Recess only 30 minutes away from the Recess venue. 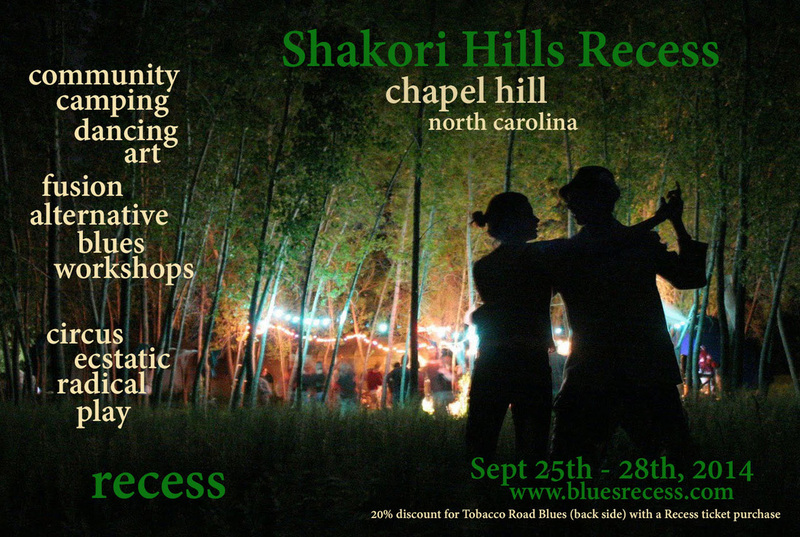 If you register for the Shakori Hills Recess, you will get 20% off your Tobacco Road registration. We are also planning a full lineup of events during the week between the two events. So if you want to come and dance 10 days straight with us..... you can! Follow Tobacco Road's event updates by clicking here. Build will begin Wednesday at 5pm, and official arrival is at 5pm on Thursday, feel free to arrive before the 5pm start time, but plan to help us set up! Everything you need for camping (or have some prearrangements to share tent space). We are talking ground pad, sleeping bag, tent, the works. Sun screen, bug spray (there are ticks! ), and clothes to be in the sun for much of the day. Temperatures at night will probably be in the 50s with daytime highs in the 80s. Your own eating utensils. We can't possibly provide enough cups, bowls, plates, and silverware for everybody without resorting to the environmentally insensitive use of disposable dishware. We will provide a washing station, but please bring a set of reusable utensils. Please note that during the event dishware inevitably becomes communal when left on our drying rack. Put your name and city on whatever you bring and don´t bring your grandmother´s china or anything else you'd be devastated to lose). bellow is our 4in x 6in promo flyer. feel free to print and distribute, or email us if you would like us to snail mail you some to help flyer your local dance scene.